I don't even know what this is a picture of! But I know I took the picture, because that's my pink glass plate, and the photo miraculously turned up on my computer — my NEW computer — today, after the lovely techs at the Mac store transferred all the crap from my old hard drive. Wow. They even found photos I was afraid I'd thrown away. See, Zoomie thought she could take the ugliest food photo, but she's wrong. She's challenged us to enter our worst pics of edibles (oh, and I can't tell you how many of those I have shot). She's even giving away prizes! Sadly, this picture of mine looks like I carefully framed and focussed it. To very little avail. Some post-op editing. No cropping, I don't think, because I almost never crop. But. What are we looking at and why did I think it was even photo-worthy? Honestly, I think it might be a Chinese dumpling. Oh wait! It's not a dumpling. 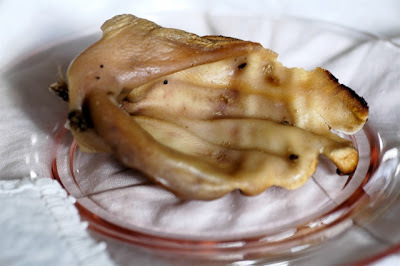 It's a roasted pig's ear. Can't make a silk purse out of that. Vicki: Isn't that the darn truth? Brown food is frumpy, and viscera are unlovely. But yeah. Hooray! I was going to guess flacid pork fat! Mouse: Did you see the tiny bite mark on the upper right? My teeth. I bit that thing. Not flaccid. Crunchy, actually. But boy, it uglee. Pig's ear? Oh, I think you should totally win! Yikes! That's a scary photo. Given the state of art today, you could enter it into an avant guard art show and win first prize. You could even put some clever title - Pig's Ear, Once Bitten, Screams Silently. Greg: I think I'm a timid person, but I always want to eat weird food. Hah! Nancy: Wow, almost haiku. I could lay the photo on the gallery floor and call it an installation. Ewww! Not the roasted pig ear again! I thought you already did that!! I am going to roast a pigs head next weekend. Maybe I will have an entry then. Mimi: I think I did post the pig ear before, but I can't locate it. Dumb blogger. It's a year old. Eek. You are awesome. Chilibrown: Head? Ohmahgah. Let me know how it comes out. You take the cake, and discourage the competitors away! Think you're going to take the prize. Anna: The tragedy is I seem to have carefully staged the photo, and it's still such an ugly dud. I don't think I'll be hearing from Saveur magazine. Wonderfully monstrous! As I looked at it, something was tugging my memory. Aha! In Chinatown there is a shop on Stockton that sells bags of sort of greasy thin almost-savory cookies in just that shape (even have those sort of stripes) called "pigs' ears" -- they look exactly like that roasted thang. Haven't had them in years, one of the secrets from my cooking teacher. Kudzu: Pig's ear cookies! From your description, I think I'd love them. Cute. .......dropped a hyphen. Should have read "sort-of-stripes".